In the Web Form Editor, click the Open PDF button in the left-hand sidebar. The Select Pages dialog box will open. Choose which form pages you want in the PDF — you can select “All pages” to print the entire form, or “Custom” to print specific pages only. If you have pre-configured additional options using the Print Configuration screen, those will appear in the dropdown as well. Once you have generated and downloaded/opened your PDF, you can print a hard copy of the form or send an electronic copy anywhere you like. In the mobile app, you can generate a form PDF using the Share option that is available in the [...] menu of the Forms List or Form Viewer/Editor. You will be prompted to choose which form pages you want in the PDF via a Share Form screen. Select “All pages” to print the entire form, “Custom” to print specific pages only, or a pre-configured Print Configuration. From here, you can download the form PDF to your device, or open/share it through an app. For details on how to generate and share form PDFs on your specific mobile platform, refer to our Mobile App User Guide. 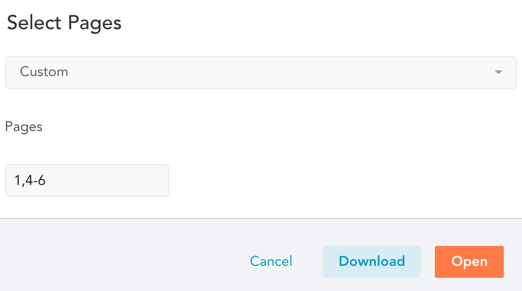 You can bulk-download multiple form PDFs at once in the Forms Tab of the web interface. To do this, check the boxes next to the forms you want to download. 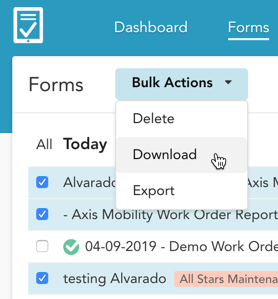 A Bulk Actions menu will appear at the top. Expand this menu, and click Download. A ZIP file will download, containing PDFs of all the forms you selected.